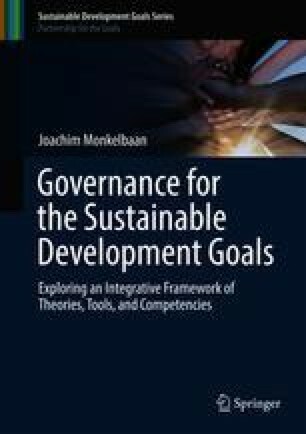 This chapter explores the question “who is involved in governance for the SDGs?” and is based on the analytical elements from Chap. 2. In that sense, this chapter is a bridge between the theories in the previous chapter and the specific case studies in the next chapter. This chapter lays out the wide range of actors (in the sense of stakeholders), interests and discourses that need to be involved in achieving the SDGs. The interviews and observations that this chapter is based on shed a critical light on the functioning of and interaction between different stakeholders involved in governance for the SDGs. Two main types of actors and institutions were identified early on this research. The first type traditionally operates at one level on a specific geographical or jurisdictional scale (local governments, national governments and international organizations) as discussed in Sect. 3.1. The second type typically operates in a non-traditional, ‘multilevel’ mode (e.g. networks and corporations) or is not limited to act at specific levels (e.g. academics and powerful individuals) and is described in Sect. 3.2.